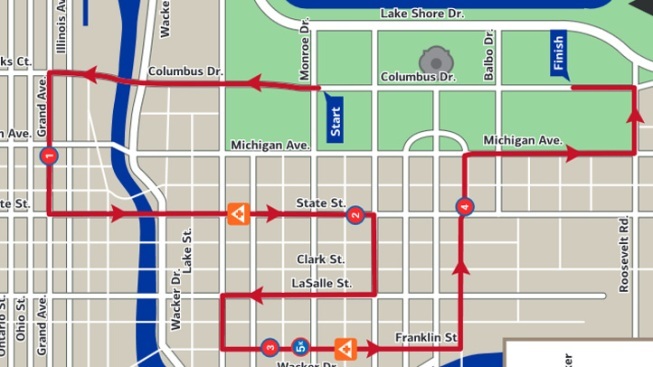 The Bank of America Shamrock Shuffle 8K course starts and finishes in Chicago’s Grant Park and mirrors segments of the famed Bank of America Chicago Marathon route. The flat and fast course is home to many personal bests and world class performances, including the women’s American 8K record (24:36) set by Deena Kastor in 2005, and the course record (22:35) set by Kenya’s James Kariuki in 1998. Runner head north on Columbus Avenue, east on Grand Avenue, south on State Street, west on Jackson Boulevard, north no LaSalle Street, west on Randolph Street, south on Franklin Street, east on Harrison Street, south on Michigan Avenue and east on Roosevelt Road before finishing up in Grant Park.